One random day, I started feeling some strain on my left wrist. However, thinking that it was just normal after continuous typing, I just shrugged it off. Unfortunately, while I was in school, the strain seemed to escalate and my wrist started to swell. During that night the strain translated into pain, but it was manageable, so I didn't give much attention to it. In the middle of the night, I was startled with pain, and it was really intense and sharp. I tried sleeping it off, but it didn't work. Hence, what I did was to take in some Paracetamol (that contains analgesic). Luckily, it helped easing up the pain albeit very temporarily. The next few days, through the help of my doctor's prescription, I was able to get through this excruciating ordeal. Anyway, I just want to share with you this experience, as well as the lessons I've learned from it. Who knows, maybe this story will equip you with something that you can use to avoid future situations like this. Painful swollen wrist technically and obviously includes both swelling and pain. 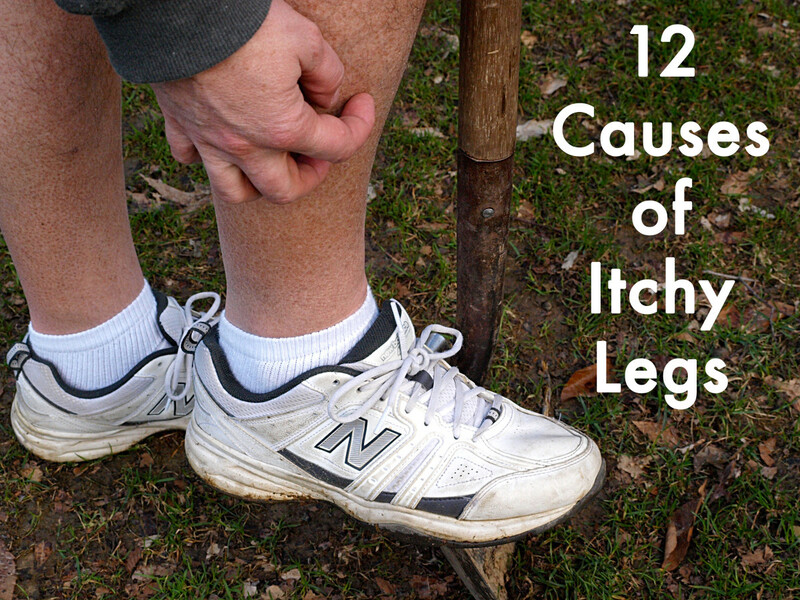 Also, this condition is characterized by numbness, soreness and/or pain. In my case, the swelling is accompanied by a sharp flickering pain (i.e. inflammation resulted to vein constriction) that is highlighted during night. In order to prevent anything like this to happen, you should be careful and watchful of the daily activities you are doing. 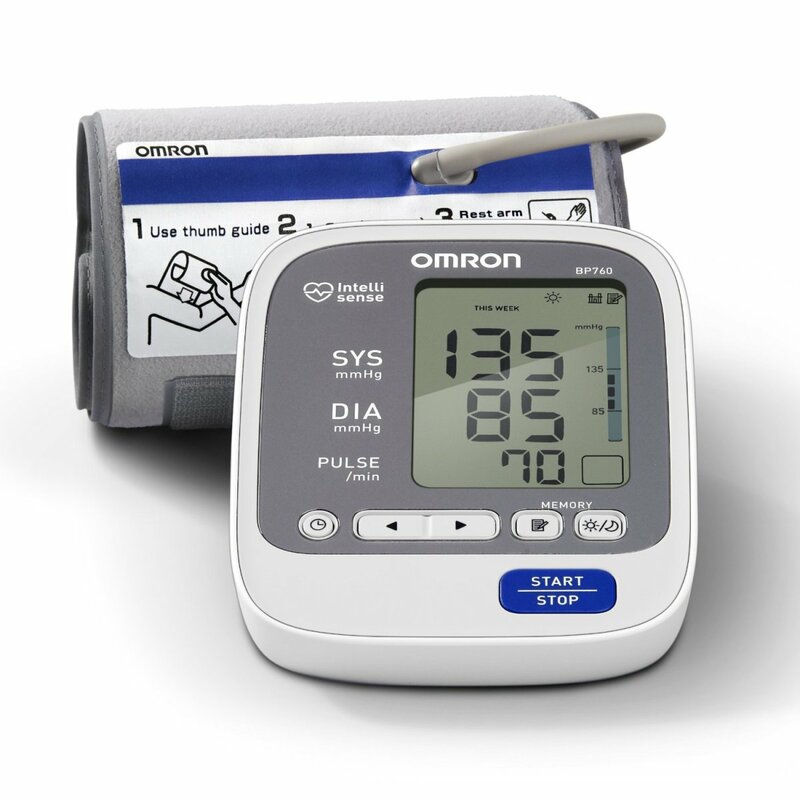 You need to identify those that may cause strain on your wrist. If you can't avoid those activities, take frequent breaks to let your wrist rest (some therapeutic exercises may help to relieve the stress). When you are feeling the strain already, discontinue activities that may have caused it. You may apply some soothing gel already to help ease the strain. In case, the strain led to pain, you may follow some of the temporary remedies below. What I mean by temporary is the time before you actually see your doctor. For example, the pain surfaced during the night, and doctors are unavailable at that hour on. You will be left with no choice but to apply basic and temporary remedy. This is the case I am referring to when we speak of temporary. You have to take note that the things listed here are temporary remedies. I can't give you any guarantee that this will work, although it did for me. Also, each of us may have a different case of wrist swelling (e.g. different causes and different condition); hence, there is a possibility that the temporary treatment here may not be applicable or advisable. Thus, I'll reiterate that you need to see your doctor for verification and/or identification of your condition. What our university doctor advised was for me to buy a anti-inflammatory soothing gel (i.e. 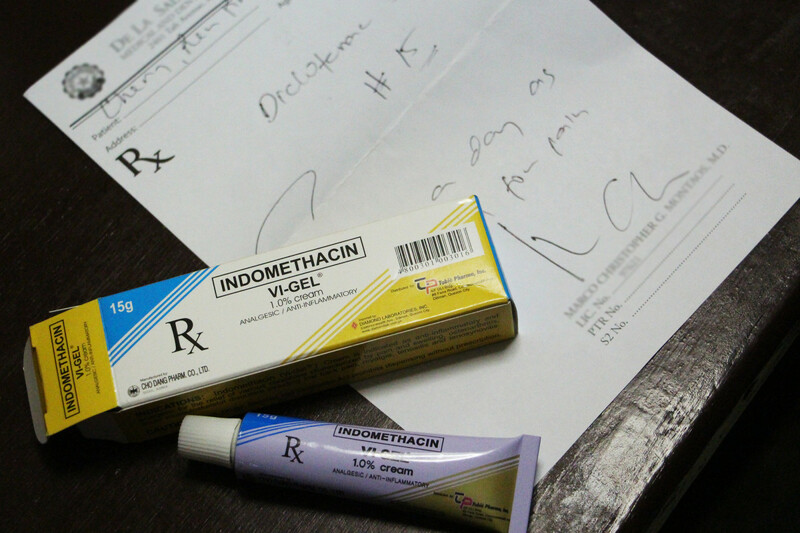 Indomethacin) instead of a pain-relief patch. He emphasized that we need to target here is the root cause of pain which is the inflammation and not the pain itself. My doctor said that I can use it 3-4 times a day. The gel is applied only on the affected area and must not be massaged vigorously, since we want to avoid unnecessary pressures or movements. This will reduce unnecessary movement involving your wrist which may be helpful in faster recovery. 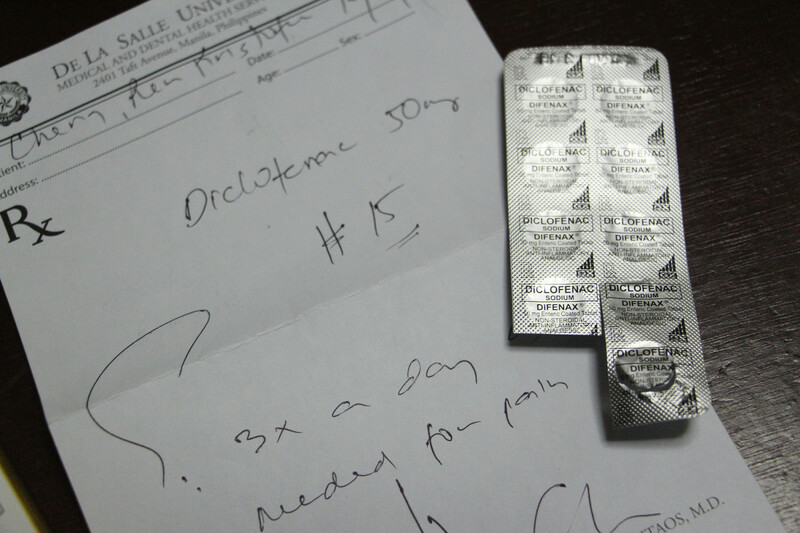 Aside from the ointment, the doctor also prescribed an oral medicine for me to take which was the Diclofenac Sodium. This was intended to further reduce the inflammation causing the pain. This was to ensure that inflammation is not only targeted externally but internally as well. The doctor said that I can take it whenever needed for pain, but advised that I must not go beyond taking the medicine thrice a day. The doctor mentioned that I can apply hot compress to ease up the swelling, and help the blood flow well with the constricted vein. This can be done thrice a day aside from all the things mentioned above. Another suggestion coming from the doctor was to use a splint to control the movement of my hand and wrist. This was to prevent any actions (e.g. bending or anything that may cause pressure) that may worsen the inflammation. I believe this has been effective, in my case. 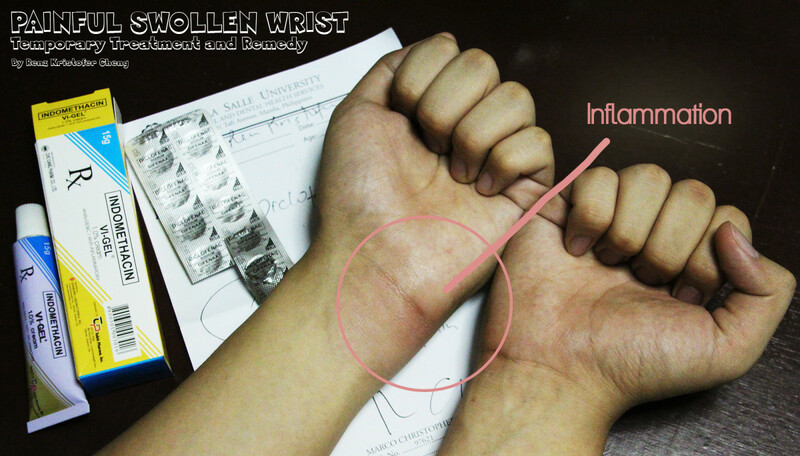 Upon following the doctor's advice and after 3 days of medication, I got rid of my painful wrist swelling. For the first day, the medicine and ointment didn't seem to work on me, since I still frequently feel sharp pains. However, the following days the medicine started to kick in, and the pain gradually until it fully subsided. Occasionally, I still feel a slight but almost negligible pain on my wrist, so up to now, I am extra cautious about my arm's movement. Nevertheless, I am extremely happy that I got rid of my condition, since it was perhaps the only moment in my life I felt intense and persistent pain. Don't worry, you will get yours treated too in no time! You are welcome! I'm just sharing this for those who experience or will be experiencing the pain I endured, and how I battled it. Thank you for sharing the tips and great advice.